The Future Ready Schools® (FRS) publication, A Guidebook for Success: Strategies for Implementing Personalized Learning in Rural Schools, helps education leaders capitalize on existing assets while addressing their community’s challenges. This guidebook highlights how district leaders can use the research-based FRS framework and free planning resources to leverage opportunities and overcome challenges inherent in their rural setting to transform teaching and create a personalized learning experience for their students. To help rural districts overcome these challenges, FRS developed a research-based framework and five-step planning process to guide schools and districts as they transition to a personalized learning model centered on individual student learning and facilitated by innovative instruction accelerated by the smart integration of technology. Future Ready Schools® (FRS) announces the release of eight Planning with a Purpose micro-credentials designed for FRS district leaders and leadership teams. 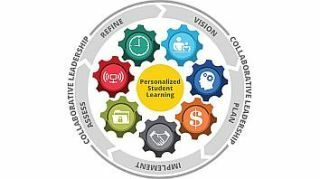 The FRS Planning with a Purpose micro-credentials use the FRS planning tools (interactive dashboard) to show mastery in developing an implementation plan to deploy personalized learning strategies across a school system—public, private, or charter. Each micro-credential covers one of the seven FRS framework topics (also called “gears”) plus collaborative leadership. Submission is free and should take less than two hours if the district has collected specific gear assessment data via step 3 of the FRS five-step planning process. There is no limit to the number of team members from one district who may earn a micro-credential in each topic. Micro-credentials specifically address step 3 of the FRS five-step planning process and are designed to recognize achievement and mastery of individual team members. Future Ready Schools® announces FRS Principals, the latest expansion of the FRS initiative that supports personalized learning and innovation.FRS Principals helps school leaders develop the necessary skills to lead a successful FRS school; build an in-depth understanding of change management; and showcase leadership culture necessary for success. Through eight FRS institutes planned for 2017, FRS Principals will tap an active network of like-minded educators beyond their own school, district, and state for help and advice when challenges arise. FRS Principals is the latest track to be added to the FRS initiative, joining dedicated #FutureReady resources for librarians and instructional coaches. Future Ready Schools® announces the new Instructional Coaches Framework and Strand, created by over 15 leading instructional coaches. The FRS Instructional Coaches strand provides instructional coaches with research-based strategies, protocols, and resources to help coaches effectively collaborate with and support their schools and districts with professional learning designed to strengthen instructional practices. Instructional Technology Specialist Laura Nylen explores Personalized PD for Future Ready Librarians.